HomeSingle ReviewsSingle Review: George Strait, "Drinkin' Man"
Single Review: George Strait, "Drinkin' Man"
An alcoholic examines his past and present with clear eyes, looking into the mirror while still holding on to the bottle. With sad resignation, he remembers the parents who worried about him, the friends that tried to save him, and the woman who loved him in spite of his affliction. Strait isn't known for dealing with such challenging subject matter, but his experience as a singer and remarkable growth as a songwriter have resulted in the genre's best drinking song in recent memory. It's something that Merle Haggard or George Jones would have produced at their peak. I don't know if radio can handle something this substantive from an artist that they tend to love most when he's frivolous these days. But whether or not it receives wide airplay, this is the finest single that George Strait has ever released. Retro Single Review: Tim McGraw, "Something Like That"
I really like this song. I don’t know if this is something I’d want to hear on a morning drive radio show, or when I first wake up in the morning if I turn on the radio, but I do hope this gets some amount of airplay. Its a good song and one of George’s better in years, I do agree! “I love this song, and I’m so glad that he released it as a single. If George doesn’t win awards for this – and the album – then I will know for sure that the industry has gone to ****. (Lookin’ at you, ACM. )” …. totally agree with you Keith. This is a great song written by George, his son Bubba and Dean Dillon. Definitely hope it does well for him, a great COUNTRY song. I didn’t expect this to be released as I single, but it’s a magnificent song and I do hope it will do well on the radio and recognized at the award shows. It’s got that dark “Whiskey Lullaby” feel to it. Very good song. No attempt is made to make the alcoholic a sympathetic character. There is no indication in the lyrics of any attempt on his part to get help. I’m shocked this will actually be a single. Great move by the people involved in making that decision! If you haven’t listened to George’s current album “Here For a Good Time” you need to. Dean Dillon, Bubba Strait, and George Strait wrote seven of the eleven captivating songs on the CD. MCA and George were going to release “Poison” but had second thoughts and released “Drinkin’ Man” as the third single. 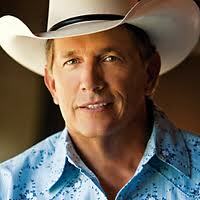 George has found another path on the mountain to keep himself current and important to Country Music, and his fans. He is still showing the young guns how it’s done, he is the real deal. Thrilled this is a single, too, though not yet ready to proclaim it his best ever. A more memorable melody/arrangement could’ve taken it that extra step higher, I think. Still easily one of the best things released to country radio in years, though. I don’t like this song and it’s probably my least favorite on the album. “Lone Star Blues” would have been an awesome choice because it’s been so long since Western Swing has been on the radio and who better than King George to bring it back!!! I don’t know in terms of quality if I would rate this higher than “You’ll Be There” or “The Chair”. It’s certainly in the upper echelon on Strait singles, I just don’t know, I suppose given that it is a newer song, if I’m going to rate it higher than the two mentioned. Linda Robbins said that “MCA and George were going to release “Poison” but had second thoughts and released “Drinkin’ Man” as the third single.” Did George Strait tell you or some executive at MCA, otherwise how would you know that? LOVE this. Country music at its finest. Heard this in the car, for the first time, today. I had to stay in the car until it was finished. It’s a very powerful song….If you’ve ever known an alcoholic its like a glimpse into their soul.